Dubai’s 2017-2018 cruise season is now well under way and it’s on track to be the emirate’s busiest yet. 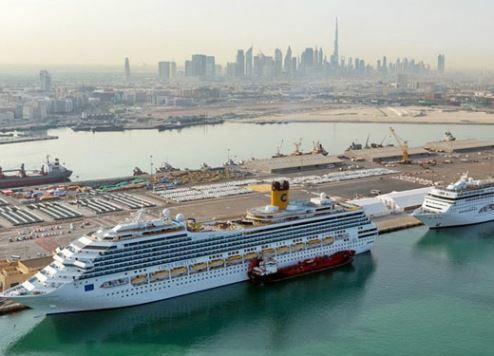 Port operator DP World is expecting at least 115 luxury cruise ships operated by 22 cruise lines to berth at Mina Rashid’s Dubai Cruise Terminal facilities during the season, delivering more than 650,000 passengers to the city’s shores. This compares to the 625,000 cruise tourists who visited Dubai during the 2016/2017 cruise season. New world-class cruise lines continue to dock in Dubai too, including Crystal Cruises, which this season has selected the emirate for the company’s flagship liner to make its maiden voyage in the region following an extensive refurbishment. Crystal Symphony’s month-long dry dock redesign is the most extensive in the ship’s history, according to the company, which says its decision to make Dubai the location for the regional debut of the liner’s new look is a reflection of the city’s global reputation as a top cruise destination. Another cruise industry heavyweight, P&O Cruises, has also revealed plans to home port in Dubai for the first time this year. Hamad Bin Mejren, senior vice president, Dubai Tourism, says Dubai’s continued investment in its cruise infrastructure is “paying dividends”. “We are seeing a steady increase in visitors opting to commence their international cruise itinerary in Dubai, and for pre-, or post-cruise stays, in the city,” he explains. Dubai continues to invest in sophisticated cruise infrastructure, with Dubai Harbour, a new destination planned in the emirate’s Mina Seyahi area located between Palm Jumeirah and Jumeirah Beach Residences, set to feature two new cruise terminals, Dubai government-owned developer Meraas recently revealed. Plans to build a first terminal were unveiled in January this year but the capacity is now set to double enabling the two terminals to accommodate 1.2 million passengers annually. Meanwhile, Hamdan bin Mohammed Cruise Terminal (T3) at Mina Rashid is set to be the largest terminal in the world, capable of handling 18,000 travellers per day. “With a goal to attract 20 million tourists a year by 2020, of which at least one million are expected to be cruise tourists, we are committed to providing facilities that are the best in the world and create a truly luxurious cruise experience catering to the tastes and sophistication of visitors,” says Sultan Ahmed bin Sulayem, group chairman and CEO of DP World. Mohammed Abdul Aziz Al Mannai, executive director of Mina Rashid, adds: "We’re expanding our facilities to accommodate more ships by adding new berths while developing our existing 2km-long berths in line with the demand from cruise operators. We’re also working on connecting our existing terminals with closed corridors equipped with the best in technology to maximise capacity and provide ease of access for passengers across the port." Dubai Government has rolled out various initiatives to support the cruise tourism sector, making it easier and faster for tourists to process paperwork. The Dubai General Directorate of Residency and Foreigners’ Affairs has also implemented simplified visa procedures, including issuing multiple entry UAE visas exclusively for cruise tourists. For these reasons, Dubai Tourism says it is well on track to achieve its 2020 target of one million cruise passengers – the same year the emirate aims to receive 20 million overnight visitors. In his keynote address to cruise line executives and regional industry stakeholders at the opening session of the recent Seatrade Middle East Cruise Forum, Issam Kazim, CEO, Dubai Corporation of Tourism and Commerce Marketing (DCTCM) revealed his vision for cruise passengers to feel the "soul" of Dubai. His plan is to focus on excursions that show cruise passengers the heritage of the city and its older districts, as well as the more modern areas and attractions. At the same forum, Esam Ahmed, commercial manager, Mina Rashid & Mina Hamriyah, DP World, revealed plans for additional berths to handle up to seven mega ships and the development of a new terminal to meet market demand by 2020. Cruise tourism within the Arabian Gulf has experienced “explosive growth over the past five years”, according to Chris Hayman, chairman, Seatrade UBM EMEA. “As deployment continues to boom, destinations across the region have already made major investments in cruise terminal facilities to accommodate an expanding fleet of ships, which are increasing in capacity from season to season,” he says. Hayman notes how eight years ago, just 87 cruise ships docked in Dubai in 2009 – a number that nearly doubled to 157 during the 2016-2017 winter season. As Dubai continues to invest heavily in cruise-related infrastructure, from airports, ports, terminals and cutting-edge public transport, to a wide range of new cultural, leisure and entertainment attractions, more cruise lines are expected to move their ships to the city during the winter season, appealing to a growing number of travellers looking to discover what the ever-evolving city has to offer.